President Yoweri Museveni has urged cultural leaders in the country and the elite to audit cultural practices in society and identify those that can be retained and modernized. IGAD Executive Secretary Amb.(Eng.) Mahboub Maalim conducted an official mission to Kampala on 29 July 2014 where he held consultations with the First Lady and Minister of Karamoja Affairs of the Republic of Uganda H.E. 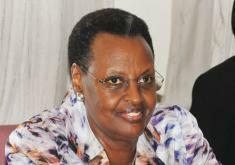 Janet Museveni. The First Lady who is also the Minister of Karamoja Affairs, Mrs. Janet Museveni has commended the good bilateral relations prevailing between Uganda and India. She paid the tribute at State House, Nakasero, when she met the new Indian High Commissioner to Uganda, H.E. Ramesh Chandra.